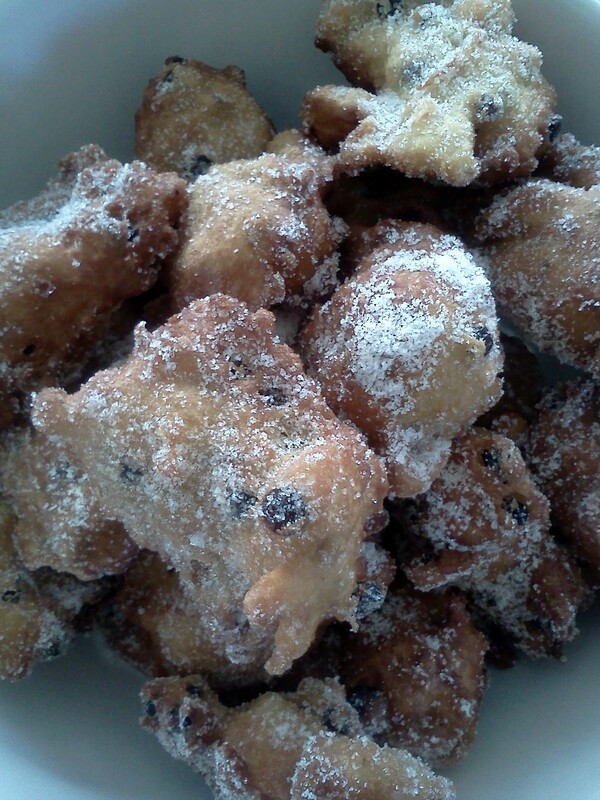 Fritule – Croatian doughnuts – are something I’ve been meaning to try to make for years. My Dida (grandfather), Petar, used to whip them up for family functions – us kids couldn’t get enough of the doughy, sugary treats peppered with sultanas. But, its been a long time between fritule – Dida hasn’t been with us for 25 years and none of the whanau has been brave enough to try making them since (in truth, a few of them have but none of us saw the results – which, I understand, could have passed for off-colour golf balls). Two weeks ago, my dear Aunty Mary died. In true Croatian tradition, there was plenty of good food at the wake. This was my inspiration for finally giving fritule a go – one of Mary’s 80+ year old friends had gotten up at 3am to make a mountain of them for the funeral. I figured if she could do it, so could I. Despite Mum’s protestations (I apparently make a mess in her kitchen and was staying with her at the time), I pulled out a recipe and the rest is history – or, in the family’s case, centimetres added to the already bursting post-Christmas waistlines. While fritule are not something you can whip up in five minutes, they are not complicated and are well worth the effort. Soak the sultanas in the 2 Tbsp of brandy and a good splash of boiling water. When possible, try to leave them for a few hours to soak up the juices. Put half the milk into a measuring jug and add a teaspoon of sugar and the yeast. Mix briefly with a fork and set aside for 10-15 minutes until yeast activates. Sift the flour and salt into a small bowl or onto a plate. Lightly whisk the eggs, sugar, brandy and lemon rind. Mix in the rest of the milk, followed by the yeast mixture. Slowly add the flour, beating quite firmly with a wooden spoon. Add the sultanas and continue to mix. The mixture should be quite thick and begin to come away from the wooden spoon. Cover the bowl and set aside in a warm spot for an hour or so until it rises. Heat oil in large saucepan or a deep fryer (at around 180C but not too hot). Test that the oil is ready by dropping in a bit of batter – it should immediately come to the surface and start to ‘sizzle’. There is all sorts of advice as to the best way to get the dough into the oil as it tends to stick. I use two long handled dessert spoons and dip them in oil before getting a small spoonful of batter and using the second spoon to help drop the dollop into the hot oil (Mum says you are supposed to avoid getting ‘tails’ on the fritule but my Uncle Ivan tells me he loves the ones with tails – so I say do whatever works for you!). Don’t overcrowd your pan – the fritule need room to move. Remove fritule from the pan and drain on paper towels. Roll in cinnamon sugar (or just sugar) and serve within hours. Great on their own or with ice cream. Best eaten within hours of making them. Ahhh, actually you do Julie. Now we have a recipe that produces results, we must all learn it and pass it down. So, get out the yeast and get the kids to work! They are gorgeous aren’t they. Like you, mine are full of memories. Good luck making them – the more you do it, the more confident you’ll become and better they’ll be! Enjoy.